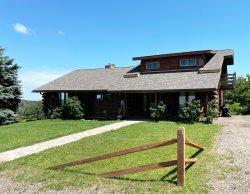 This home made of real logs has a living room with a 55" Smart TV & a 5-disc DVD player and a wood-burning stone fireplace, There is a dining area and full kitchen, three bedrooms plus a loft bedroom (TV in each) and 2 full baths, 1 with 2-person shower. There is a lower level rec room with ping pong table, karaoke system and Play Station 3, washer/dryer, central A/C and a great room with French doors leading to the wrap-around deck. Enjoy the new outdoor fire pit or charcoal grill. Authentic Amish-made log beds and other furnishings warm up the interior. There are two outdoor swimming pools near the home. Christmas Mountain Village is a complete year- round vacation resort featuring a beautiful golf course & driving range, restaurant & lounge, game room, hiking trails, downhill and cross-country skiing, snowboarding and snow-tubing. No matter what season, you will love your stay at Tannenbaum! Would definitely recommend to a friend and will be looking to book this property again. Excellent maintenance service and a very clean house. Called about internet and staff answered my question right away and was very friendly about it. Staff at checkin were so friendly! They made us feel welcome right away. Very laid back and down to earth. This lodge is exactly what we needed and wanted. It was so nice to get up and relax on the deck with breakfast with all 12 guests. In a hotel, we would have had to have split up or bounced around between rooms. We had plenty of room to sleep, prepare meals, and get ready for our day there. Definitely will book again with this company if I am back in the area! Staff are all very friendly and helpful. Home is a beautiful log cabin with a fireplace perfect for relaxing and spending time with family. Everyone was wonderful. They couldn't have been more accommodating or friendly. This is our third stay and third property through Sand County. Every experience has been terrific and I have recommended Sand County to friends.